Beautifully engraved certificate from the Rutland Board of Trade issued in 1889 to F. M. Butler. This historic document has an ornate border around it. This item is hand signed by the board's president and secretary, and is over 111 years old. Rutland (Vermont), city in central Vermont, near the Green Mountains. Rutland is a commercial and manufacturing center located in a year-round resort area. Manufactures include medical equipment, textile goods, electrical supplies, paper products, machinery, aircraft accessories, iron castings, and printed materials. 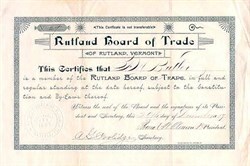 Rutland was settled in 1770 and incorporated in 1892. It comprises the original village of Rutland, which the city succeeds, (together with about as much more territory taken from the town of Rutland outside the village limits. The city contains about eight and one-quarter square miles.The greatest distances are north and south three and one tenth miles and east and west three and one-tenth miles. The remainder of the original Town of Rutland extends all around the city varying in width from one-quarter to two and one-half miles.